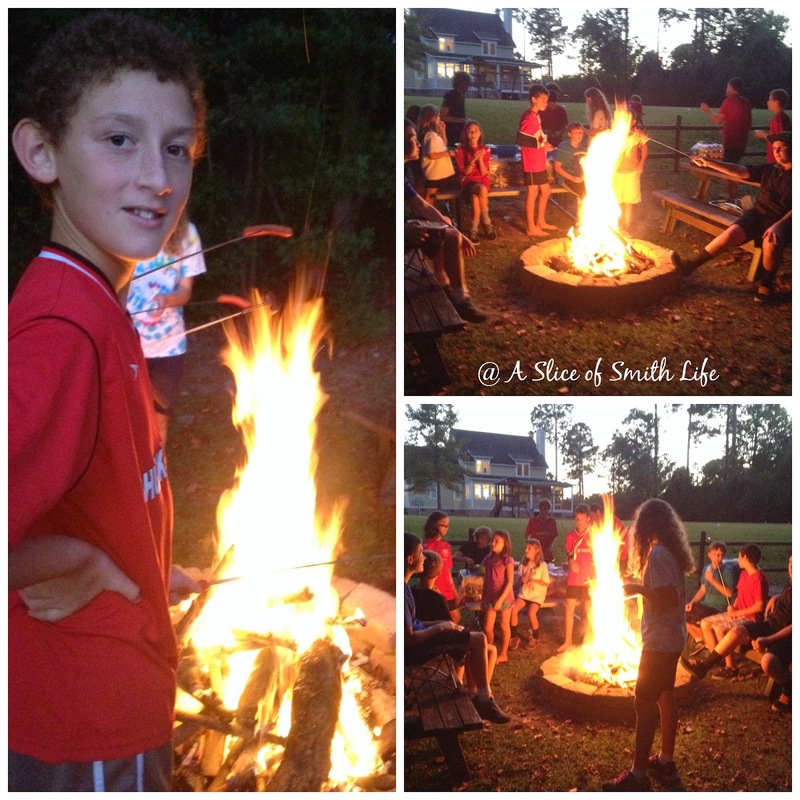 Last night, we celebrated our son's 13th birthday party with a Fire Pit Party! His birthday was last Sunday, October 19, but due to a stomach virus that was an unwelcomed guest in our home the week prior to his birthdate, we had to postpone the party. His cake this year was inspired by Jessica's Campfire Cake over at Shower of Roses. 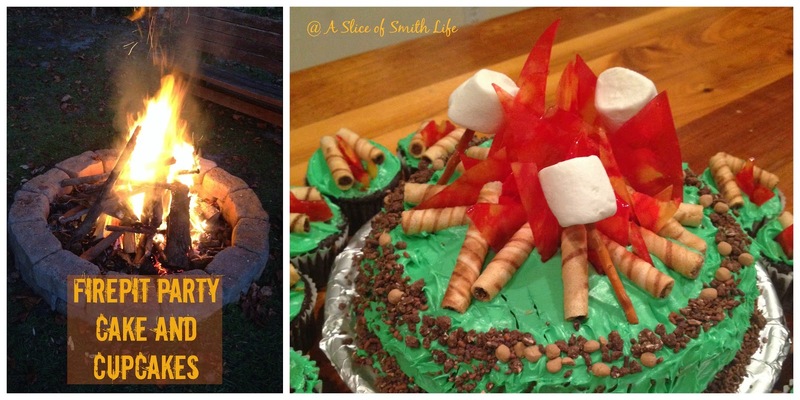 Since our party would be outdoors with some football and soccer games and then roasted hot dogs and dessert around our backyard fire pit, I came up with this fire pit cake and cupcakes. Our fire pit is in our backyard near our woods and my husband made the pit with stones around it on the ground. My son wanted homemade cream cheese icing (that I dyed green to look like grass), so that's why the cake is green with "stones" surrounding the "fire pit." 1) Unwrap 5-10 butterscotch and cinnamon hard candies. 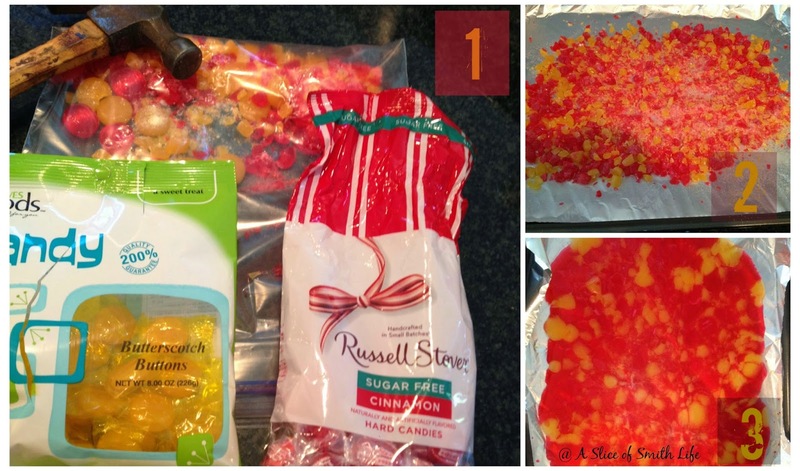 Place the candies in a large ziplock bag and use a hammer to crush candy into small pieces. 2) Line a cookie sheet with aluminum foil and spray foil with non-stick spray. 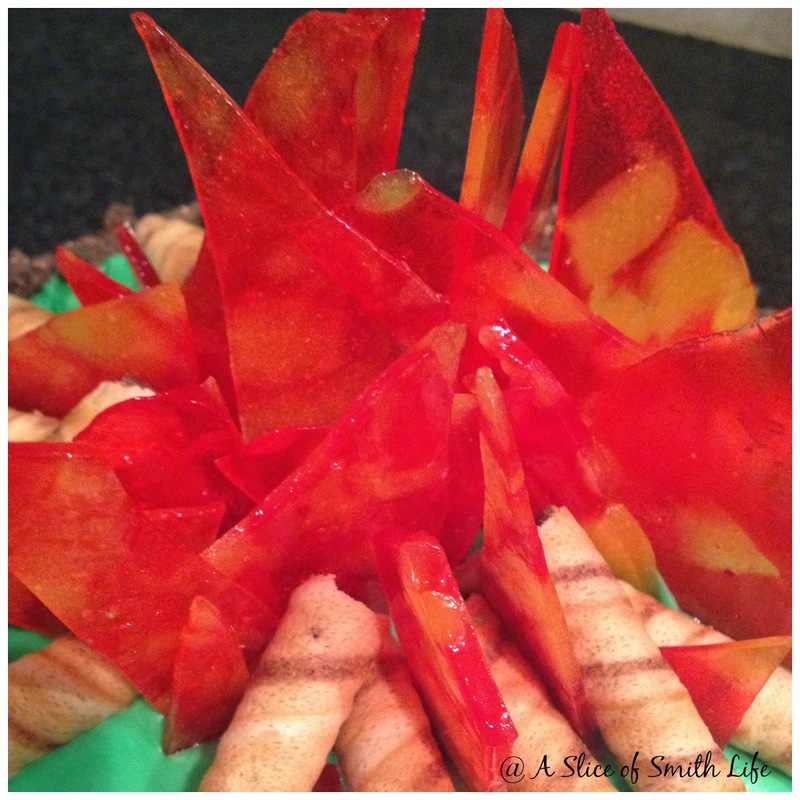 Spread out crushed candy pieces on foil. 3) Put in oven at 350 degrees for 6-8 minutes until candy is melted. Let cool before handling. Then to make the flames, just break apart the candy into pieces with sharp/pointed edges and arrange the flames in between the campfire logs. I bought Pirouline Artisan Rolled Wafers (Chocolate Hazelnut) and broke them in half and arranged them on the cake to make it look like logs stacked in a fire. Use about 5-10, depending on how many you want to arrange. I found these German Chocolate Cake sprinkles in the grocery store. As soon as I saw them on the shelf, they immediately reminded me of our fire pit stones. I thought I would add some marshmallows on a pretzel stick burning in the fire and placed logs and flames on homemade chocolate cupcakes. The chocolate cupcake recipe from the outside of the Hershey's container is so delicious and always a family favorite. 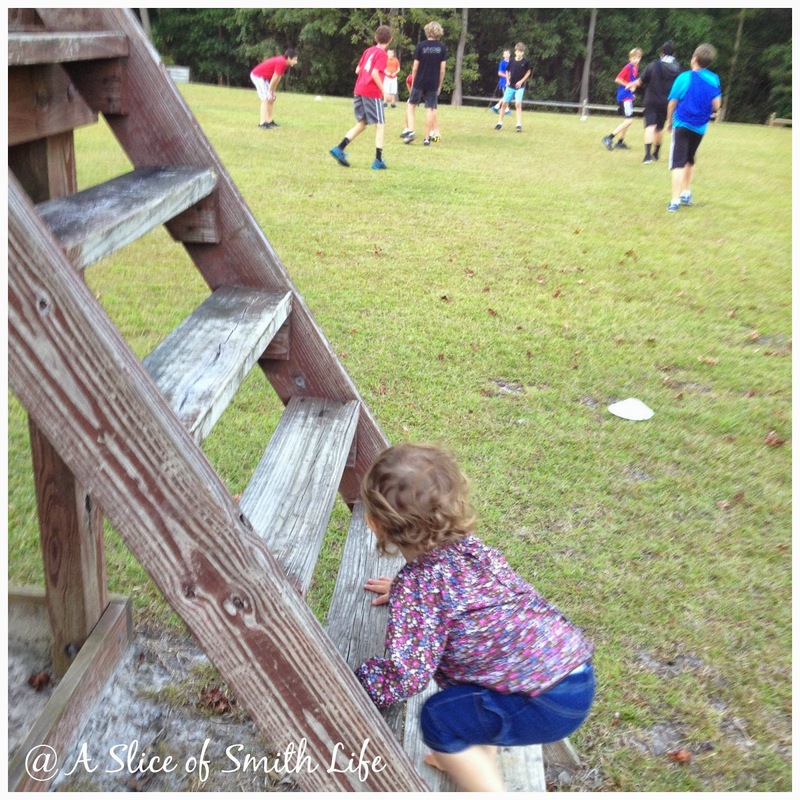 While my husband and the boys played some tag football and soccer games in our backyard, I was watching our littlest one climb our swing set and go down the slide. Then it was time for roasted hot dogs by the fire pit, snacks, cake, and S'mores. 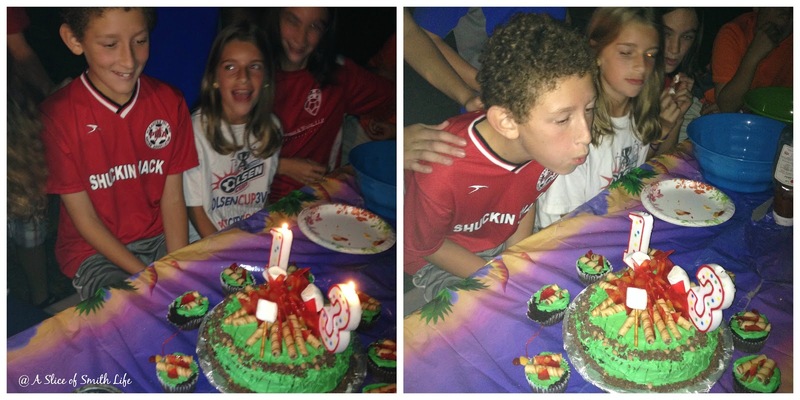 It was a wonderful evening celebrating our son's 13th birthday! It was a lot of fun and many special memories were made by all! So glad you had the opportunity to still celebrate the #13!!! Thanks so much Jessica! Thanks also for sharing all your wonderful ideas that definitely inspire me! I am loving this post!! Loving!! I read your post this Am when I opened my email but didn't have a chance to com til now. WOW, amazing! SO impressed...and your son is such a sweetheart. I'm sure he appreciate all your efforts to make him a great cake and party! I thought MY campfire cake was pretty darn good...look at YOURS! It's jaw dropping! 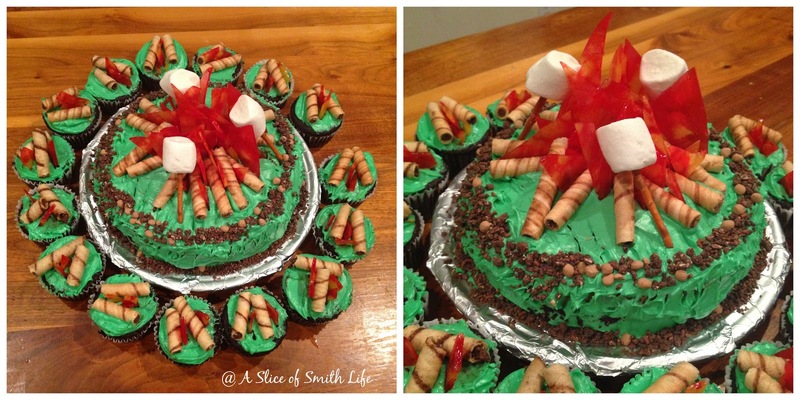 Here is the cake we made for my son's Hunger Games party. 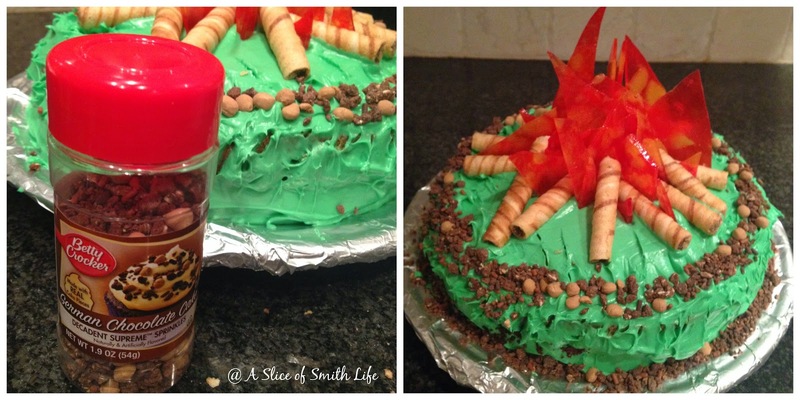 :http://campfiresandcleats.blogspot.com/2013/11/victory-tour-girl-on-fire-cake-and.html It's def good but not as fancy as yours. I feel like making that cake again and better this time!! Thanks for the peek at the party!! Happy bday to your sweetie! (And if you have any pirate ship ideas...love to hear them, friend!) Thanks! Thanks Chris for your visit and kind comments! Thanks for the link to your HG birthday post! I went over and left you a comment! I loved your cake and it looks like your boys had a blast at the party! Wow, what an awesome cake. It looks almost too good to eat. Popping by from Creative Mondays. 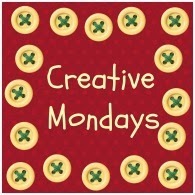 Thanks for sharing at Creative Mondays, pinned and featuring later this week at the bloghop..